‘Sciatica’ relates to the sciatic nerve and the pain or symptoms that occur when this nerve is compressed, irritated, or inflamed. The typical pattern of sciatica pain begins in your back or buttocks and moves down the back of your leg, radiating around the outside of your knee and lower leg into your big toe and second toe. Weakness, tingling, or numbness in the leg may also occur. Sciatic pain can be extremely debilitating, affecting every aspect of life. Simple tasks like getting out of bed, coughing, sneezing, or even using the bathroom can become a painful experience. Often people with sciatica wait until the pain becomes unbearable before they contact the chiropractor. Waiting can cause further damage. It is important that you contact your chiropractor when the pain originally begins. Your chiropractor will establish an accurate diagnosis from a thorough evaluation of your health history, examination, and xrays or other imaging, then discuss the results and outline recommendations for your care and recovery. 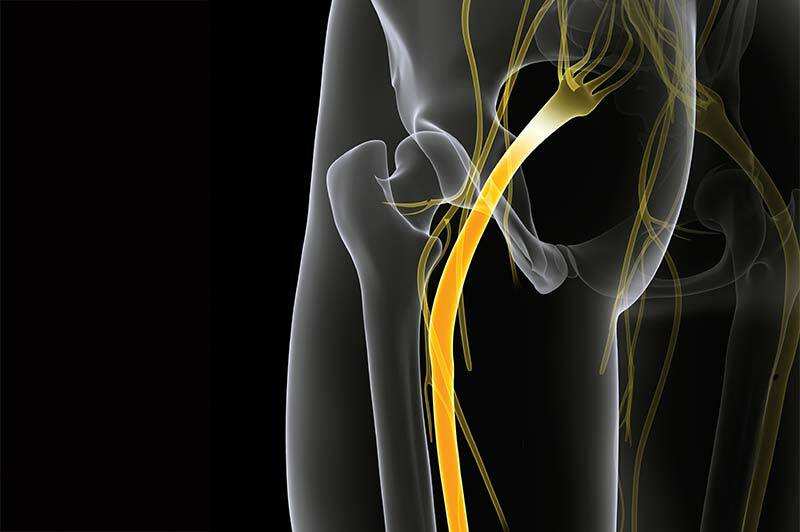 Sciatic nerve pain is the result of improper care of the lumbar spine and long-term damage. An accurate diagnosis of the underlying cause of the problem and early conservative intervention are key elements of recovery with chiropractic care. Maintaining good spinal function with healthy lifestyle practices and chiropractic care is the best way to prevent painful conditions like sciatica from developing.